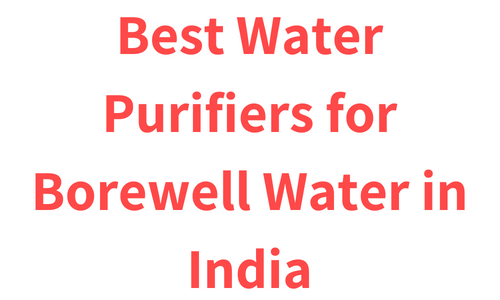 If you are looking for best water purifiers for borewell water then I must say you are at the right place. 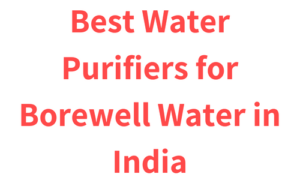 Because in this article I am going to review best water purifiers which you can used for the purification of bore well water. Now lets see detailed review and pros and cons of these water purifiers. If you are looking for a water purifier with elegant looks and advanced sensors then Aquaguard Geneus is ideal for you. This water purifier comes with a unique elegant looks as well as intelligent sensors which are very practical as well. First let’s talk about the design and build of this water purifier. As mentioned above, this water purifier has a very unique and elegant looks. It also comes with a glass holding lever which is quite convenient. At the front there are notification LEDs and just below that there is a tap for dispensing water. Overall the built quality of this water purifier is very good. Now let’s talk about the purification of this water purifier. Aquaguard Geneus comes with RO, UV and UF water purification Technologies. As this water purifier comes with intelligent sensor. It automatically senses what kind of water purification would be required for the available water, which is quite useful because it will help to retain the essential minerals in the water. For example if you have a water purifier with low TDS water and if such water please purified with RO purification then it may remove essential minerals like sodium and iron from the water. Thus making water unhealthy for consumption. Now that’s look at the RO purification of this water purifier. This water purifier is consist of RO membrane which has very minute pores of 0.00001 microns. The water is passed with a great force through this RO membrane. Due to which dissolved solids and solids as well as heavy metals like mercury, arsenic and lead get separated from the water. Ultimately converting hard water into soft water and making the water consumable. Now let’s talk about the UV purification of this water purifier. This water purifier has two stages in his UV purification. The first stage of purification is of ultrafiltration. This stage contains UF membrane which removes physical and visible impurities from the water, making it clean and clear. Once all the physical and visible impurities are removed from the water then it is passed for UV purification where it gets exposed to the UV rays of the UV bulb which inactivates harmful bacteria, viruses and protozoa from the water making the water 100% microbe-free. This water purifier also comes with a TDS controller which as the name suggests helps you to control the TDS of water. This feature is quite useful when you have a low TDS water because with the TDS controller you can adjust the TDS of the water which will help to retain essential minerals in the water. Water having TDS over 500mg/l is considered as high TDS water and hence harmful for consumption according to Bureau of Indian Standards (BIS). This water purifier comes with a water storage tank of 7 litres, which is made from Food grade plastic which is non-toxic and durable as well. Aquaguard Geneus is equipped with some advanced intelligent sensors which are very practical. Now let’s have a look at the sensors this water purifier offer. The advance sensor basically notifies you whenever the water purifier will require any kind of maintenance like whenever any of the filter filter or cartridge needs to be changed. The genuine membrane sensor warns you if any duplicate membrane is fitted in the water purifier. This feature is quite useful. The smart autofill feature will automatically fill the water in the water storage tank whenever the water level decreases ensuring you get pure water every time. Aquaguard Geneus is also equipped with a biotron cartridge which basically breaks down the water molecules so that it will be lot easier for your body to absorb it. With the test guard Technology Aquaguard geneus automatically census what kind of water purification would be required for the available water. This feature is very useful and will help to retain essential minerals in the water. Aquaguard geneus comes with a user friendly LED display which enables you to adjust the water purification process. It also notifies you about the water level in the water storage tank which is quite useful. Users like the water purification of this water purifier. They also appreciate that sensors this water purifier offers. Some users also found the maintenance of this water purifier quite expensive. If you are looking for a water purifier with unique and elegant looks which will enhance the look of your kitchen then Aquaguard Geneus is a good choice for you. Besides good looks this water purifier is also equipped with RO, UV and UF water purification technology along with some advanced sensors which are very practical as well. Overall the build quality of this water purifier is very good as well. If you are looking for a reliable water purifier with all the essential features with the reasonable price tag then Kent Grand Plus is ideal for you. This water purifier comes with traditional looks but it has a very good water purification system. First let’s have a look at the design and build of this water purifier. This water purifier comes with traditional looks. There are various filters in the upper side of this water purifiers which are visible and are covered with a transparent cover. On the lower side there is water storage tank and traditional tap for dispensing water. This water purifier also comes with water level indicator which is quite useful. Now let’s have a look at it’s stages and each filter of this water purifier. The first stage of purification have sediment filter which removes suspended sediment and physical impurities like sand, mud and dust from the water, making it clean and clear. The second stage of purification has activated carbon filter which removes harmful chlorine and chlorine by-products. This filter also removes bad taste and odour causing contaminants from the water. Third stage of purification is of ultrafiltration. This stage of purification have UF membrane. This membrane have minute pores of 0.01 micron which removes bacteria and cysts from the water. RO purification comes in at the fourth stage of purification. This page of purification contains RO membrane which have minute pores of 0.00001 microns. The water is passed with the great force through this membrane which blocks dissolved Salts and solid from the water as well as harmful heavy metals like mercury, arsenic and lead. UV purification comes in at the fifth stage of purification. At this stage of purification the water is passed in the UV chamber where it gets exposed to the UV rays of the UV bulb, which inactivates harmful bacteria, viruses and protozoans from the water, making the water 100% Microbe-free. The sixth stage of purification has post carbon filter which adds essential minerals in the water for enhancing taste of the water. Kent Grand Plus does not uses any kind of chemicals for the purification, ensuring you get 100% chemical free water for consumption. Kent Grand Plus comes with a TDS controller which as the name suggest, helps you to control the TDS of the water. TDS controller also helps in retaining the essential minerals like iron and sodium etc in the water. Kent Grand Plus comes with a water storage tank of 8 L, which is made from Food grade plastic which is non-toxic and durable as well. Kent Grand Plus comes with two LEDs, which will notify you whenever you will have to change any of its filter or whenever the UV bulb becomes ineffective. Kent Grand Plus is equipped with spin welded RO membrane. This membrane will not get easily damage due two physical impurities like sand, mud and dust, ensuring the long life of it. Kent Grand Plus is equipped with high power 11 watt UV bulb which is more effective in inactivating harmful bacteria, viruses and protozoa was from the water. Kent Grand Plus is equipped with built in SMPS which basically works as an voltage stabilizer, which stabilizes the high voltage current during voltage fluctuations ensuring no harm will couse to the water purifier during voltage fluctuations. Push-fit components basically means that all the components are attached to each other in such a way that it will not cause any kind of water leakage. Kent Grand Plus performs all its operations automatically like filling the water storage tank whenever the water level decreases, this feature is quite useful. Users are very happy with the purification of this water purifier. If you are looking for a reliable water purifier with all the essential features and a very economical price tag then Kent Grand Plus is ideal for you. This water purifier comes with RO, UV and UF water purification along with 6 stage water purification. Additionally this water purifier comes with all the essential features like a good alert system, spin welded RO membrane, high power UV bulb, built in SMPS which basically works as and voltage stabilizer and pushpit component etc. Overall the built quality of this water purifier is good as well. If you are looking for a good looking and stylish water purifier with a good water purification system as well, then Pureit Ultima RO + UV water purifier is ideal for you. This water purifier has a very modern and futuristic looks. It has a fully digital display and also it comes two Germkill kits and 6 stage water purification. Now let’s talk about the design and built of the water purifier. Pureit Ultima has a very modern futuristic looks. It has a large fully digital display and below that there is a water dispensing system. This water purifier does not comes with traditional Water dispensing Tap, instead it has button for dispensing water. The cool thing is, when you press the button for dispensing water and neon blue flashlight turn on which really looks cool. Now let’s have a look at the purification of this water purifier. Pureit Ultima comes with a RO + UV water purification. This water purifier also comes with two germkill-kits as well. The first germkill kit is designed to purify water upto 4000 litres whereas 2nd germkill kit is designed to purify water upto 8000 litres. Now let’s have a look at each stage and its filters. The first page of purification has pre sediment filter which removes fine and coarse particulate impurities and visible impurities like Sand and Dust from the water making it clean and clear. The second stage of purification has Pre RO carbon filter which removes harmful Chlorine and chlorine by-products from the water. It also remove bad taste and odour causing contaminants as well as volatile organic compounds (VOCs) from the water. Third stage of purification has post carbon sediment filter which removes remaining physical and visible impurities from the water like sand, mud, dust etc, ensuring that no harm will cause to the RO membrane due to such impurities. RO purification comes in at the fourth stage of water purification. This stage of purification has a RO membrane. This membrane has very minute pores of 0.00001 microns. The water is passed with a great force through this membrane. Due to which dissolved solids and solids get separated from the water. It also removes harmful heavy metals like mercury, arsenic and lead etc. UV purification comes in at the fifth stage of water purification. At this stage, the water gets exposed to the UV rays of the UV bulb, which inactivates harmful bacteria and viruses from the water making the water 100% microbe-free. The sixth and the final stage of purification is consist of post carbon filter and TDS modular. This water purification stage works as an polisher and make sure that no impurities are remained in the water. The TDS modular enhances the taste of the water by adding essential minerals in it. Pureit Ultima does not uses any kind of chemicals for the purification, ensuring you get 100% chemical free water for consumption. Pureit Ultima comes with a large 10 litre water storage tank, which can be considered larger than the normal RO water purifiers because on average the maximum capacity of water purifiers is usually 8 litres. So Pureit Ultima has an edge over its competitors when it comes to water storage tank. The water storage tank is made from Food grade plastic which is non-toxic and durable as well. Pureit Ultima performs all its operations automatically like filling the water storage tank when the water level gets decreased. This water purifier also requires electricity for dispensing water. Pureit Ultima comes with an inbuilt voltage fluctuation guard, which protects the water purifier during voltage fluctuations by stabilizing high voltage current, ensuring the long life of this water purifier. If you are pretty concerned about the decor of your kitchen and looking for a modern futuristic water purifier or if you need a water purifier with a large water storage tank then Pureit Ultima is ideal for you. Besides good looks, this water purifier also has a pretty good water purification system as it comes with RO + UV water purification and two germkill kit and a 6 stage water purification. If you are looking for a water purifier with transparent water storage tank then Kent Pearl RO + UV + UF water purifier is ideal for you. This water purifier comes with a transparent water storage tank which is detectable as well. Also this water purifier has a RO + UV + UV water purification. Now let’s talk about the design and build of this water purifier. As mentioned above Kent Pearl has a transparent water storage tank which is detachable as well and you can easily remove it without any help of professionals for cleaning which is quite convenient. Also the transparent water storage tank gives you confidence that the water you are thinking is 100% safe. This water purifier comes with a traditional water dispensing tap and two LED indicators. Overall the build quality of this water purifier is good. Kent Pearl comes with RO + UV + UF water purification. Now let’s have a look at each of its stage and its filter. The first stage of purification is consist of sediment filter which removes physical and visible impurities from the water like sand, mud and dust etc. The second stage of purification is consist of activated carbon filter which removes harmful chlorine and chlorine by-products. It also removes bad taste and odour causing contaminants from the water. The third stage of purification is of ultrafiltration. This stage of purification is consist of UF membrane which removes bacteria and cysts from the water. The Fourth Stage of purification is a RO filtration. This stage is consists of RO membrane. The water is passed to the great force through this membrane, due to which dissolved salts and solids get separated from the water. This membrane also removes harmful dissolved heavy metals like mercury, arsenic and lead from the water. When there are no visible or physical impurities remained in the water then the water is passed for the UV filtration. At this stage the water gets exposed to the UV rays of the UV bulb which inactivate harmful protozoa, bacteria and viruses from the water making the water 100% microbe free. The 6th stage of purification works as an polisher and removes remaining impurities from the water and add essential minerals in the water, which enhances the taste of water and makes water healthy for consumption as well. This water purifier also comes with a TDS controller which helps you to control the TDS of water. It also helps to retain the essential minerals in the water. Kent Pearl comes with a high powered UV bulb of 11 watt, which is more effective in inactivating harmful protozoa, bacteria and viruses from the water. Kent pearl comes with a spin welded RO membrane which is damage proof. It will not get damaged due to Physical impurities like dirt or mud. So you can expect the long life of its RO membrane. Kent Pearl comes with a built in SMPS. SMPS basically works as an voltage stabilizer which stabilizes the high voltage current during voltage fluctuations, ensuring no harm will couse to the water purifier due to high voltage current. Kent Pearl performs all its operations automatically like filling the water storage tank whenever the water level gets decrease this feature is quite helpful. All the components of Kent Pearl water purifier are push fit. The push fit components basically means that, all the components of this water purifier are attached to each other in such a way that it will not cause any kind of water leakage, which is the relief. Users are happy with the transparent water storage tank of this water purifier because it gives them the confidence that the water they are drinking is 100% clear and safe. Some users also found some stains on the water storage tank if it is not cleaned periodically so cleaning the water storage tank periodically is recommended. If you are looking for a water purifier with transparent water storage tank and a good water purification system then Kent pearl is ideal for you. This water purifier comes with a transparent water storage tank which is detachable as wall, so you can easily remove the water storage tank for cleaning without any help of professionals. Also this water purifier comes with RO, UV and UF water purification which is a complete solution for any kind of water. The built quality of this water purifier is good as well. If you are looking for a compact water purifier with a good water purification which comes with a very economical price tag then Pureit advanced RO +MF water purifier is ideal for you. This water purifier has a very compact body also it comes with RO + MF water purification with a very economical price tag. First let’s have a look at the design and build up this water purifier. As mentioned above Pureit advanced water purifier has a very compact body so it will not take much space to fit-in, so if you have limited space then you should consider this water purifier. This water purifier is made from Food grade plastic which is non-toxic and durable as well. It is also equipped with a break resistant traditional Water dispensing Tap. Now let’s look at the purification of this water purifier. Pureit advanced is equipped with RO + MF water purification. Now let’s look at each stage and its filter. The first stage of purification has pre sediment filter which removes visible or physical impurities from the water like sand, mud etc. The second stage of purification is consist of Pre RO carbon filter which absorbs harmful chlorine and chlorine by-products from the water. It also removes pesticides, herbicides and bad taste and odour causing contaminants from the water. The third stage of purification has post carbon sediment filter which removes remaining impurities from the water like fine particulate impurities, dust, mud etc. This purification stage basically works as an protector for RO membrane, which ensures that no harm will caused to the RO membrane due to physical impurities like dust or mud. The Fourth Stage of purification is consist of RO membrane. The RO membrane has very minute pores of 0.00001 microns. The water is passed with the great force through this membrane which removes dissolved Salts and solids from the water. The fifth stage of purification is consist of microfiltration. This page of purification is consist of MF membrane. The water is passed with the great force through this membrane. This membrane allows water molecules only to pass through it and blocks harmful contaminants from the water. The sixth stage of purification has post RO carbon filter, which removes bad taste and odour causing contaminants from the water. It also enhances the taste of water by adding essential minerals, which makes water healthy for consumption as well. Pureit advanced RO + MF water purifier does not uses any kind of chemicals for the purification, ensuring that you get 100% chemical-free water. Pureit advanced water purifier comes with an inbuilt voltage fluctuation guard, which stabilizes the high voltage current during voltage fluctuations, ensuring that no harm will cause to this water purifier during voltage fluctuations. This water purifier comes with a water storage tank of 5 litres, which is made from Food grade plastic which is non-toxic and durable as well. This water purifier perform all its operations automatically like filling the water storage tank with water whenever the water level decreases. Users are very happy with the purification of this water purifier. They also appreciate the compact design of this water purifier and its economical price tag. This water purifier does not comes with any kind of filter change notification indicator so you will have to change its filter periodically, as per mentioned in the user manual. As this water purifier comes with a small water storage tank user having big family found this water purifier quite inconvenient. If you are looking for a economical and compact water purifier with a good water purification then Pureit advanced RO + UV water purifier is ideal for you. This water purifier has a very compact design and this water purifier comes with RO + MF water purification which is pretty good solution for any kind of water. This water purifier does not have any kind of filter change notification indicator so you will have to change its filter periodically. Also it have a small water storage tank of 5 litre. If you are looking for a stylish water purifier with a good water purification capacity then Blue Star majesto RO + UV water purifier is ideal for you. This water purifier has a very stylish look and it comes with a RO + UV water purifier which is very effective in purification of any kind of water. This water purifier also have a very high purification capacity of 258 litres per day. Now let’s first have a look at the design and build of this water purifier. Blue Star Majesto comes with a very stylish look. At the front this water purifier has two LEDs and below that there is a tap for dispensing water. Now let’s move to the purification of this water purifier. Blue Star majesto comes with a RO + UV water purification. This water purifier completes its water purification process in six stages. Now let’s have a look at each stage of purification and its filters. The first stage of purification is consist of Pre sediment filter which removes visible or physical impurities from the water like sand, mud, dust and other suspended particles from the water. The second stage of purification has copper impregnated activated carbon filter which removes bad taste and odour causing contaminants, volatile organic compounds (VOCs) and also bacterias from the water. The RO membrane has very minute pores of 0.00001 microns. Water is passed with a great force through this membrane, due to which dissolved solids and solids gets removed from the water. It also removes harmful heavy metals like arsenic, Mercury and lead from the water. The Fourth Stage of purification is of UV filtration. At this stage, the water is passed in the UV chamber, where it gets exposed to the UV rays of the UV bulb which inactivates harmful bacteria, viruses and protozoa from the water. The fifth stage of purification has post carbon filter which removes remaining impurities from the water. The sixth stage work as an polisher. This stage has Aqua taste booster which enhances the taste of water. Blue Star majesto comes with a large water purification capacity of 258 litres per day. So if you have more consumption of water then we should consider this water purifier. This water purifier comes with a large water storage tank of 8 litres. Blue Star majesto comes with Child lock function at the tap, which basically prevents the wastage of water. Blue Star majesto comes with Aqua taste booster. This aqua taste booster contains calcite. The calcite media is very effective in neutralizing acidic or low pH water and also it helps in enhancing the taste of water. This water purifier also complete a tank full indicator which will notify you whenever the water storage tank get fully filled. So you can shut off the water purifier. User are very happy with the purification of the water purifier. Users having big families found this water purifier convenient because this water purifier has a very good purification capacity of 258 litres for a day. Though this water purifier have full tank indicator but it does not have auto shut off feature, so you will have to manually shutdown the water purifier, once the water storage tank gets fully filled. Some users also experience a beeping sound coming out from this water purifier for a long time whenever they start this water purifier. If you are looking for a stylish water purifier with a good water purification capacity then Blue Star majesto is ideal choice for you. This water purifier has a RO + UV water purification which is very good for the purification of any kind of water. This water purifier also comes with a unique Aqua taste booster which contains calcite which helps neutralizing acidic or low pH water and it will also help in in enhancing the taste of water. Overall the built quality of the water purifier is very good as well. If you are looking for a water purifier with good water purification technology and and economical price tag then Livpure Pep Pro Plus RO + UV + UF water purifier is ideal for you. This water purifier has a compact, elegant and sleek design and RO + UV + UF water purification, which is very effective in the purification of any kind of water and it all comes with a very economical price tag. Now first let’s have a look at the design and build this water purifier. As mentioned above Livpure Pep Pro Plus has a very elegant and sleek design. This water purifier comes with a small notification display and just below that there is a traditional tap for dispensing water. Overall the built quality of this water purifier is very good. Livpure Pep Pro Plus comes with RO + UV + UV water purification. The first stage of purification is of sediment filter which removes visible and physical impurities from the water like sand, mud and dust etc. The second stage of purification is of Pre activated carbon filter which absorbs harmful chlorine and chlorine by-products from the water. It also removes pesticides from the water along with bad taste and odour causing contaminants. The third stage of purification is consist of antiscalant cartridge. This antiscalant cartridge basically removes the Salt from the water which may deposit on the RO membrane and can form a layer. This stage basically works as an protector for RO membrane, which increases the life of the RO membrane and purification capacity of it. RO filtration comes in at the fourth stage of purification. This stage of purification is consist of RO membrane which has very minute pores of 0.00001 microns. The water is passed with the great force through this RO membrane, which allows water molecules only to pass through it and blocks dissolved solids and solid from the water. It also removes dissolved harmful heavy metals like mercury, arsenic and lead. The fifth stage of purification is of UV filtration. At this stage of purification water is passed to the UV disinfection column, where it gets exposed to the UV rays of the UV bulb which inactivates harmful bacteria, viruses and protozoans from the water, making water 100% microbe-free. The sixth stage of purification is consist of silver impregnated post carbon filter. This stage basically works as an polisher and removes remaining impurities from the water and it also increases the taste of the water by adding essential minerals in it. Livpure Pep Pro Plus comes with a water storage tank of seven letters which is made from Food grade plastic which is non-toxic and durable as well. This water purifier is equipped with an alert system which will notify you about power on, purification, tank full indication and UV fail Buzzer. The UV fail buzzer basically warns you whenever the UV bulb becomes inactive. Users are very happy with the sleek and elegant look of this water purifier. They are also happy with the purification of this water purifier. And this all comes in with a very reasonable price tag. If you are looking for a compact and elegant water purifier with a good water purification then Livpure Pep Pro Plus is ideal for you. This water purifier has a very elegant design and RO + UV + UV water purification, which is very effective in purification of any kind of water. Overall the built quality of this water purifier is very good as well. If you are looking for a compact water purifier with a large water storage tank and some unique features then Livpure Touch Plus is ideal for you. This water purifier has a very compact body but still it has a large water storage tank of 8.5 litre. This water purifier also comes with some unique features like multi dispensing options. Now first let’s have a look at design and build quality of this water purifier. As mentioned above Livpure Touch Plus is a very compact water purifier. At the front there is a small notification display and buttons for dispensing water. The dispensing system is situated at the bottom of this water purifier. The built quality of this water purifier is very good. Livpure Touch Plus comes with RO, UV and UF water purification. This water purifier completes its water purification in seven stages. Now let’s have a look at each stage of purification and the filters of this water purifier. The first stage is consists of Pre filter which removes visible and physical impurities like Sand, Dust and mud from the water. The second stage of purification is consist of sediment filter which removes sediments and other suspended impurities from the water. The third stage of purification has pre activated carbon filter which removes chlorine and harmful chlorine by-products it also remove pesticides, herbicides and bad taste and odour causing contaminants from the water. The Fourth Stage of purification is consist of antiscalant filter. This stage basically works as an protector for the RO membrane. It removes the salt which can get deposit on the RO membrane before RO filtration. This not only will increase the life of the RO membrane but also it will increase the purification capacity of it. RO filtration comes in at the fifth stage of purification. This stage is consists of RO membrane. The RO membrane has minute pores of 0.00001 microns. The water is passed with the great force through this membrane, which separates dissolved Salts and solids from the water it also removes dissolved heavy metal like mercury, arsenic and lead. UV purification comes in at the 6th stage of purification. At this stage the water is passed in the UV chamber where it gets exposed to the UV rays of the UV bulb, which inactivates harmful protozoa, bacteria and viruses from the water making the water 100% microbe free. The seventh stage of purification is of ultrafiltration. This stage of purification is consist of UF membrane. The water is passed through this UF membrane which removes bacterias and cysts and other suspended particles from the water, making the water 100% clean and clear. Livpure Touch Plus does not uses any kind of chemicals for the purification, ensuring you get 100% chemical free water for consumption. Livpure Touch Plus comes with a water storage tank of 8.5 litre which is made from Food grade plastic which is non-toxic and durable as well. This water purifier comes with a very good alert system. The alert system has all the essential features like this water purifier will notify you whenever you will have to change any of its filter. You can also check the filter life of this water purifier any time in the menu section. This water purifier also shows you the quantity of water consumed and the quantity of water left in the water storage tank. Livpure Touch Plus does not comes with a traditional water dispensing tap for dispensing water. Instead this water purifier has buttons for dispensing water. This water purifier comes with three buttons which will dispense water of different quantities. Now let’s have a look at each button and its functioning. When you choose this water dispensing option, the water purifier will display the water enough for filling one glass of water. When you choose this option the water purifier will dispense water enough for filling a bottle of water. As the name suggests when you choose this option the water purifier will continuously start dispensing water until you manually turn off the water flow. Besides these three dispensing options Livpure Touch Plus also comes with a manual valve for dispensing water. This water purifier also comes with a taste enhancer which enhances the taste of water by adding essential minerals in it, which makes the water healthy for consumption as well. Users really appreciate the build quality of this water purifier. They also like the multistage dispensing option that this water purifier provides at the same time same user also found it inconvenient. If you are looking for a compact water purifier with a large water storage tank and very good build quality then Livpure Touch Plus is ideal for you. This water purifier also comes with RO, UV and UF water purification so this water purifier is able to purify any kind of water. This water purifier has a large 8.5 litre water storage tank but still it has a very compact body so if you have limited space and you need large water storage capacity then you should consider this water purifier. Also this water purifier comes with a unique multistage dispensing option and taste enhancer. If you are looking for a RO water purifier with solid water purification system and transparent water storage tank then Havells Maxx water purifier is ideal for you. This water purifier is equipped with RO and UV water purification and it has 7 stage water purification system. This water purifier is also equipped with a large 8 litre water storage tank. Havells Max comes with a very modern design and look. This water purifier comes with a very unique design which allows it to fit in in corners very easily. This is a wall mountable water purifier and you can use it as tabletop as well. You can mount this water purifier in corner or it can also be mounted on the flat walls as well. It comes with a unique Zero Splash Faucet which benefits hygienic water, zero splash and smooth water flow. This water purifier have a transparent water storage tank as well, which is pretty convenient as you can get an idea about the water level in the water storage tank. Overall Havells Max have a pretty solid build quality. Havells Max is equipped with RO and UV water purification and it completes its water purification in seven stages. The first stage of purification is consist of sediment cartridge. As the name suggests, this cartridge removes sediments from the water. This cartridge absorbs bad taste and odour causing contaminants from the water. It also remove harmful chlorine by-products from the water. RO filtration comes in at the third stage of purification. The stages consists of RO membrane which have very minute pores. The Fourth stage of purification is consist of germicidal UV chamber. At this stage, the water is passed in the germicidal UV chamber where it gets exposed to the UV rays of the UV bulb, which inactivates harmful bacteria and viruses from the water making the water 100% microbe free. Mineralz cartridge comes in at the 5th stage of water purification. At this stage the pH of the water is corrected which makes the water tasty and healthy. Silver Impregnated Taste Enhancer comes in at the 6th stage of water purification, which as the name suggests enhances the taste of the water and it also removes remaining organic impurities from the water. Revitalizer Cartridge comes in at the seventh stage of purification, which restructures the water molecules resulting in improved hydration and mineral absorption. With RO and UV water purification and 7 stage water purification containing various filters Havells Max has a very solid water purification system in place. Havells Max comes with 7 litre water storage tank. The water storage tank is transparent and it is also removable as well. This indicator with notify you whenever the water purifier is on. This indicator will notify you whenever the water storage tank will get fully filled. You don’t have to shut down the water purifier once water storage tank is fully filled it will automatically shutdown the water purification process and it will automatically start the water purification process once the water level decreases. This indicator will notify you in case of any error in the water purification process like whenever the UV bulb becomes inactive or the water pump stops working. If you are looking for a modern looking water purifier with transparent water storage tank and good water purification system then Havells Max is ideal for you. This water purifier also comes with 7 litre water storage tank which is transparent as well. Also it has decent alert system. This water purifier also comes with electrical protection system which is a pretty helpful featured as it protects water purifier during voltage fluctuations. Overall is users are happy with the performance and look of this water purifier. Some users also found the maintenance of this water purifier a bit expensive. If you are looking for a modern water purifier with solid water purification technology then Havells Digitouch water purifier is ideal for you. This is a high end water purifier and it comes with a RO and UV water purification technologies. The thing that separates this water purifier from others is its modern and futuristic looks and its solid 8 stage water purification system. Havells Digitouch comes with very modern and futuristic design. This is a wall mountable water purifier and you can also use it as a table top. At the front it has touch panel with various indicators and water dispensing options. It also has lighting around its touch panel which represents different water purification processes like RO and UV. This water purifier doesn’t have traditional water dispensing tap instead it has buttons for dispensing water. It has three buttons for dispensing water which dispenses different quantity of water. When you choose the “Glass option” for dispensing water then the water purifier will dispenser water enough for filling a glass of water. When you choose “Bottle option” then the water purifier will dispense water only enough for filling water bottle. When you choose the third option which is “Free Flow” then the water purifier will continue dispensing water until you stop the dispensing by pressing the same button again. This water purifier requires electricity even for dispensing water. It also comes with a digital clock. This water purifier comes with only one colour option. Overall the build quality of Havells Digitouch is very good. Havells Digitouch is equipped with RO and UV water purification technologies and it completes its water purification in 8 stages. Now let’s have a closer look at each purification stage it’s filters and its working. The first stage of purification is of Membrane Performance Enhancer. As the name suggests, this purification stage basically helps to enhance the performance of other filters by removing physical or visible impurities like sand, mud, dust etc from the water. The second stage of purification is of sediment cartridge. At this stage harmful sediments are removed from the water. The third stage of purification is consist of activated carbon cartridge. This cartridge absorbs bad taste and odour causing contaminants from the water. It also removes harmful chlorine by-products from the water. RO filtration comes in at the fourth stage of purification. This stages consists of RO membrane which have very minute pores. At this stage, the excess TDS is removed from the water ultimately converting hard water into soft water. Fifth stage of water purification is consist of germicidal UV chamber. At this stage the water is passed in the UV chamber where it gets exposed to the UV rays of the UV bulb, which inactivates harmful bacteria and viruses from the water. The 6th stage of purification is of Mineralz cartridge. At this stage, the pH of the water is adjusted according to the source of the water which helps in retaining the essential minerals in the water and making it tasty and healthy. The seventh stage of purification is of Silver Impregnated Taste Enhancer. As the name suggests, this stage helps to enhance the taste of the water and it also removes remaining organic impurities from the water. The 8th stage of water purification is consist of Revitalizer Cartridge. At this stage the water molecules are restructured to improve the hydration and absorption. With RO and UV water purification and 8 stage water purification containing useful filters Havells Digitouch have a pretty solid water purification system in place. 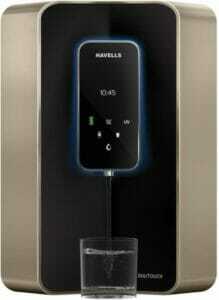 Havells Digitouch comes with 7 litre water storage tank. The water storage tank is made from food without plastic which is non-toxic and durable as well. The water storage tank is not transparent and it is basically hidden by outer body. The water storage tank is protected by ingress protection cover which stops invasion of insects and dust particles. Havells Digitouch comes with following indicators. As the name suggests, this indicator will notify you in case of any error in the water purification system and whenever the water purifier will require maintenance. This indicator will notify you about water purification process, going on in the water purifier. As the name suggests, this indicator will notify you about the remaining cartridge life of the indicator. This water purifier comes with a digital clock on its touch panel. Havells Digitouch comes with Auto-diagnostic features which basically constantly monitors the water purification process and will notify you in case of any error ensuring safe water always. Needs electricity even for dispensing water. If you are looking for a modern and futuristic water purifier with a solid water purification system then Havells Digitouch is ideal for you. This is a high-end water purifier but it also comes with an advanced water purification system and very modern look and design. It comes with RO and UV water purification with 8 stage water purification system. It also has 7 litre water storage tank and good alert system. This water purifier requires electricity even for dispensing water, which can cause problems during power cuts. If you have inverter or alternate power source, then this water purifier can work on it during power cuts. Overall users are pretty happy with the look and performance of this water purifier. Click here to check customer reviews at Flipkart. So these were the best water purifiers for borewell water. Let me know if you have any questions in the comments section will I will be happy to answer them all.